Today the church observes the feast of St. Peter’s confession. This celebration is a remembrance of the first moment when Christ was called Messiah and God. If you’ve read much of the New Testament you know that Peter’s personality is anything but rock-like. He is impetuous and sometimes foolhardy. But nevertheless, Christ founds the church on him. Why? Not because of his personality, nor his deeds, but as a result of this confession of faith. Peter sees Jesus’s true nature. He names that true nature. And he orients his life anew because of his fidelity to God in Jesus Christ. Peter is Christ’s rock because Christ is Peter’s rock. For this feast day I thought it would be fun to remember the story not only with words, but also with a special dessert. I found a recipe for edible fudge rocks online and gathered the ingredients. They were short and sweet: white chocolate, sweetened condensed milk, cookie crumbs, cocoa and a pinch of salt. Once they saw the kind of recipe I was making, my kids were definitely interested. My son melted the chocolate and condensed milk together; my daughter helped shape the rocks and mix in the other ingredients. Given that they are twelve and fifteen this is no longer anything I take for granted! There was a moment when our cocoa butter separated out and the whole mixture looked so greasy I gave up hope, but once it cooled down everything seemed to merge back together and it worked out fine. Mixing up the fudge took about ten minutes; shaping the rocks took another ten once the mixture had cooled. The fudge was good enough that I kept having to fend off requests to eat it all right away! I found a classic, public domain image of St. Peter receiving the keys of the church from Christ and printed that out to go with the rocks when they are served. 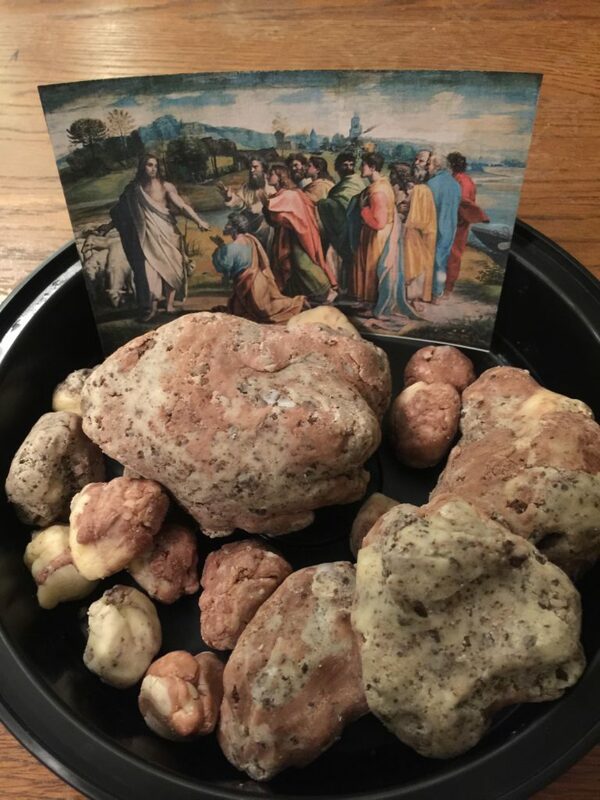 Tomorrow we’ll actually be at church for dinner, but I have a feeling that these rocks – like our confession of faith – will be even better when shared. Almighty Father, who inspired Simon Peter, first among the apostles, to confess Jesus as Messiah and Son of the living God: Keep your Church steadfast upon the rock of this faith, so that in unity and peace we may proclaim the one truth and follow the one Lord, our Savior Jesus Christ; who lives and reigns with you and the Holy Spirit, one God, now and for ever. Amen. Do you have special recipes for feast days in your family?